Just as things look to become clear they do not work out as expected. That would not be so bad if it was not for the annoying fact that this up and down has now been going on for a full five months. Again we can only work with our understanding of the pragmatic tenets of EW. 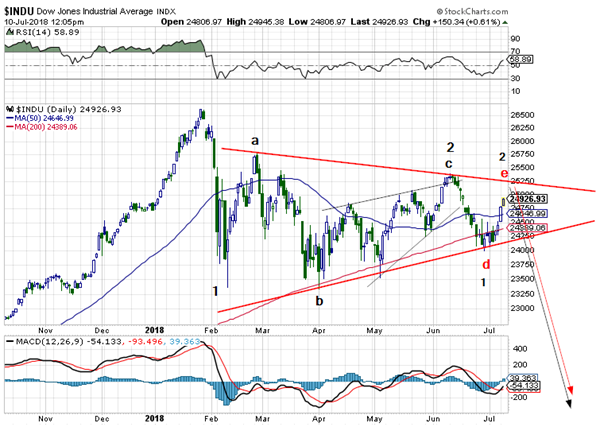 It is possible that we are in wave 2 of 3, the triangle mentioned previously would have been a little b wave in an a-b-c wave 2 that should now be near completion given that we already have more than 62% retracement. Alternatively we have a large triangle B-wave covering the entire period of 5 months. Either way the next big move should be down and down a lot. All the good stuff is on the menu. We have a president that seems to have adopted Machiavelli’s dictum of keeping your friends close and your enemies closer. In the mean time the British government seems to be falling apart. NATO is meeting and Helsinki will be the next focal point of two man summits. Maybe nothing will come of any of this but how much longer can this continue?